This mobility newsletter was originally sent on June 1, 2018. This past week, mobility has been at the center of attention for state leaders. At the annual Mackinac Policy Conference, elected officials, advocates, and industry leaders discussed the electric, autonomous, and connected future of the automotive industry. The keynote address given by Don Butler, executive director of Connected Vehicle Platform and Product of Ford Mobility, brought these themes together. “Today’s mobility model will not work for our tomorrow,” said Butler, emphasizing a need for a different approach to increase access to mobility. Several other panels at the conference addressed mobility as well: A “Mobility State” panel, featuring panelists Pavan Agarwal, Carla Bailo, Senator Gary Peters, David Sampson, and John McElroy, touched on what it will take to establish a best-in-class regulatory environment, the barriers that have yet to be addressed, and the ensuing challenges for insurance, infrastructure and other key industries. The “Training for the Future” panel, featuring panelists Carla Bailo, Mark Muro, Dan Varner, and Dave Egner, addressed how automation and technology are leading to a future with higher productivity and efficiency and increased safety and convenience. The panel discussed how to match training with workforce needs, the skills necessary to be successful in the mobility industry, and how industry can work collaboratively with training entities to establish viable career paths for low- and middle-income workers. On Wednesday at the conference, Michigan Governor Rick Snyder announced the launch of an $8 million Michigan Mobility Challenge grant program to fund projects to improve mobility for the elderly, disabled, and veterans. 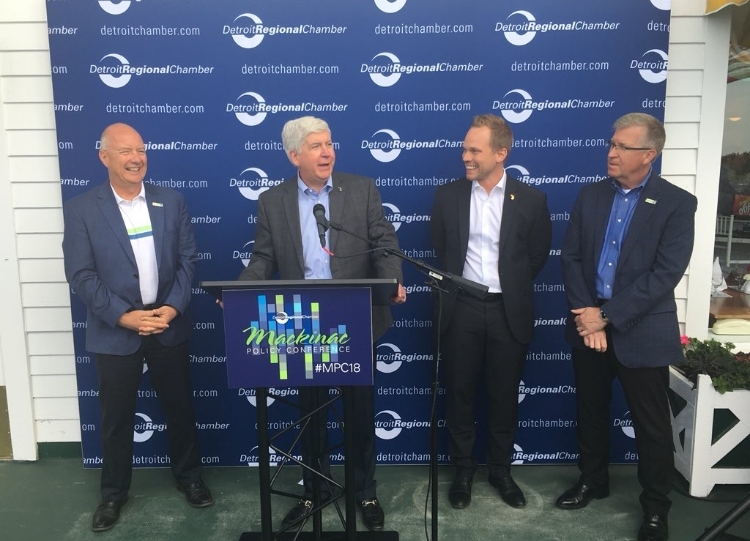 The program aims to connect the Michigan’s technology, start-up and transportation sectors, as well as service providers and advocacy groups. It will also engage state agencies, including the Michigan Department of Transportation, Michigan Economic Development Corporation, Department of Health and Human Services, Department of Military and Veterans Affairs, and Bureau of Services to Blind Persons. Snyder challenged attendees to show their creativity in developing solutions that help some of the state’s underserved populations. To add to the momentum, events in the next few weeks will continue to focus state leaders’ attention on mobility. The Intelligent Transportation Society of America’s 2018 Annual Meeting will be held in Detroit next week, June 4-7. The Intelligent Transportation Society of America (ITS) advances the research and deployment of intelligent transportation technologies to save lives, improve mobility, promote sustainability, and increase efficiency and productivity. And on June 14, Michigan EIBC will host the next EV convening, focused on DC fast charging and residential/workplace charging in Lansing. Speakers will include Jeff Mason, CEO of the Michigan Economic Development Corporation, Shanna Draheim, Director of Policy Development for the Michigan Municipal League, Jukka Kukkonen, founder of PlugInConnect, Sophie Shulman, Business Development and Partnerships Manager for Electrify America, Adam Mohabbat, EV Charging Market Development and Product Strategist for EVGo, and Robert Jackson, Director of the Michigan Agency for Energy. If you are interested in joining the conversation the future of vehicle electrification and charging infrastructure deployment in Michigan, you can download the agenda here and register for the 3rdEV Convening here. Consumers Energy filed a three-year, $7.5 million pilot EV charging station plan with state of Michigan. This is the state’s first plan by a public utility to build a network or charging stations for EVs. A University of Michigan researcher says that rolling back fuel efficiency standards is not justified by declining gasoline prices or otherwise. Utilities and oil interest groups clashed over EV policy at a conservative policy summit. Researchers in Michigan are looking to maximize the environmental benefits of electric and autonomous vehicles. Michigan EIBC and Clean Fuels Michigan testified before the House Energy Policy Committee detailing ongoing efforts to advance alternative fuel vehicles in Michigan in a second hearing on the topic organized by Representative Bellino. The city of Detroit addresses local mobility issues for residents, visitors, and employers. Clean mobility is making an impact in Michigan, contributing $18 billion to the state economy and upwards of $700 million in tax revenue annually, and creating more than 69,000 jobs. An overhaul of the Renewable Fuel Standard will include fewer waivers for small refineries and will allow ethanol exports to count toward federal biofuels quotas. President Trump’s administration is negotiating with the state of California and executives from major automotive companies to discuss relaxing fuel efficiency rules. However, a major automotive lobbying group told lawmakers it opposes a Trump administration plan to weaken federal fuel efficiency standards. Fifteen attorneys general and the city of Chicago sued the EPA for “ignoring its legal duty” to regulate emissions from oil and gas plants. The National Highway Traffic Safety Administration launched another investigation into car crashes involving semi-autonomous vehicles made by Tesla. Weakening federal fuel efficiency standards is unlikely to slow progress on electric vehicles, according to a new report. 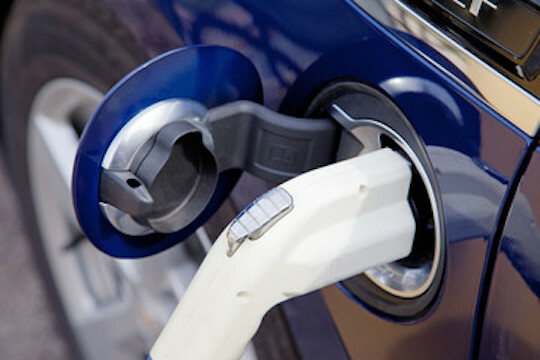 A survey finds 1 in 5 Americans plan to buy an electric car for their next vehicle. A prosecutor says Volkswagen isn’t making a serious effort to transform the company culture and hold executives accountable after its emissions cheating scandal. Electrify America will install EV charging stations at over 100 Walmart stores in 34 states. Target will add more than 600 EV charging stations at over 100 stores, compared to only 18 stations in five states today. Tesla will begin production on its Model Y, an SUV, in November of 2019. States regulators and utilities across the U.S. are developing policies around EVs to manage grid impacts, rates and infrastructure. In Ohio, state regulators approved a $10 million rebate and incentive program for utility AEP to develop nearly 400 electric charging stations in its service territory. New York City will electrify its entire bus fleet by 2040. A Minnesota nonprofit will use a $150,000 federal grant to study the potential relationship between distributed solar and EV charging stations. Researchers are exploring technology to enable electric cars to recharge while driving using the same technology that wirelessly charges mobile phones. Michigan EIBC’s third EV Convening on DC fast charging and long-dwell charging is scheduled for June 14at the Michigan Agency for Energy’s office in Lansing. The meeting will featurespeakers including Jeff Mason, CEO of the Michigan Economic Development Corporation; Sophie Shulman, Business Development and Partnerships Manager for Electrify America; and Robert Jackson, Director of the Michigan Agency for Energy. Register here.